Sloppy Joe’s the Feldman’s Deli way! So do you want your bagel with a shmear? Now Salt Lakers have a chance to answer that typical New Yawk question. 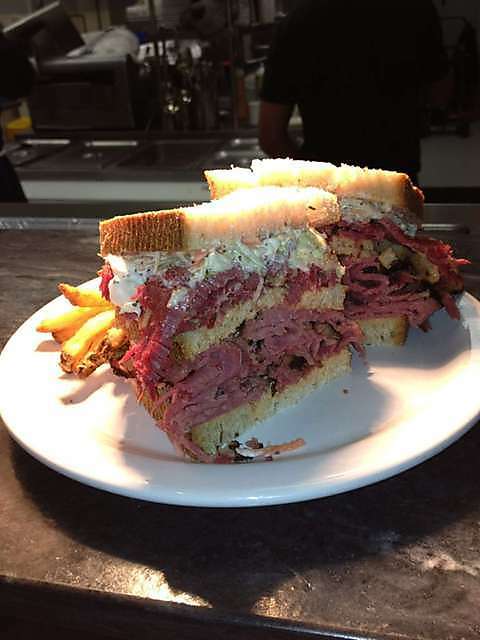 Feldman’s Deli offers iconic deli fare – pastrami sandwiches, Jewish salami, matzah ball soup, knishes and New York cheesecake. Michael and Janet Feldman own this Jewish deli outpost in Utah. Michael is a chemist who came to Utah to set up drug testing for the 2002 Olympics. Growing up in New Jersey, his family looked in vain for familiar comfort food. Since Janet came from a long line of bakery owners and is a phenomenal cook, the two decided to bring a Jewish deli to Salt Lake. They ship in meat and desserts from a deli in New York. They also ship in anything they cannot find local, such as the mustard and pickles they use. What they don’t ship in is made from scratch at the deli, including specials such as brisket and golumpki. An important part of their sandwich is the bread. Michael went on a quest to find a local bakery to make a rye that would stand up to their oversized sandwiches. He met with the owner of Stone Ground Bakery with a sample of the bread he needed. The owner asked for four days to experiment and at the end of that time Michael went back to sample it. He found that Stone Ground nailed it with a light, moist rye that was perfect for the sandwiches they were creating. No Jewish deli is complete without bagels and Feldman’s are the real deal. Janet only makes between two and three dozen a day and when they’re gone they’re gone. She could spend all day making bagels and not have time for anything else. Boiled first and then baked the bagels are light and fluffy on the inside and crispy on the outside. Feldman’s Deli is at 2005 East 2700 South. Hours are lunch, Tues-Sat 11 AM-3 PM. Dinner Thurs-Sat 5:30 PM-830 PM.